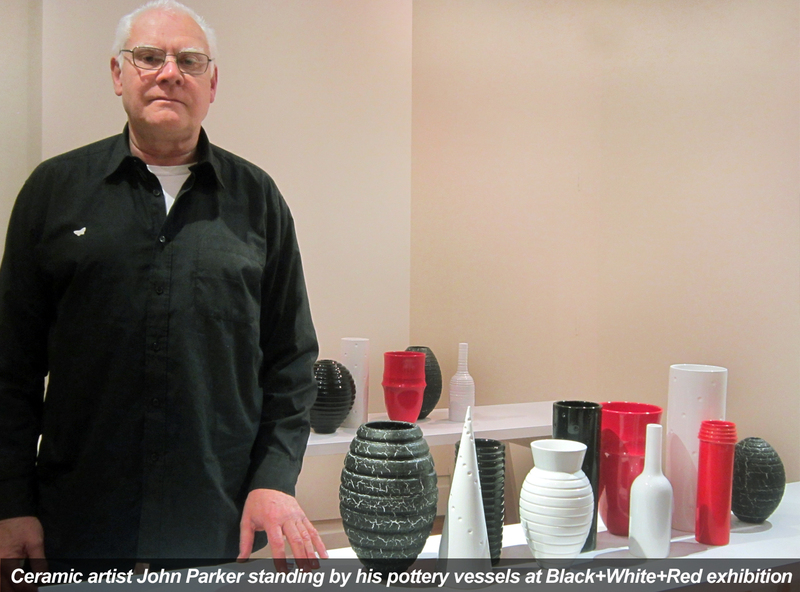 Artist John Parker presents new ceramic works in black, white and red, a colour palette that he believes encompasses New Zealand, Aotearoa as an evolving nation. This series refers to the colour range of the national Māori (Tino Rangatiratanga) flag which was identified through a nationwide consultation process. As an artist Parker plays on ceramic traditions and discourse. His pieces are typically recognisable as bottles or vases, however he pushes these forms beyond the traditional pottery vessel shape towards stark minimalism. The artist says, “my concerns are with finish and control and the infinite possibilities of minimalism.” His semi functional forms contribute to the debate between functional and non-functional objects. His works exist in the territory between handmade originals and mass produced ceramics. Highly finished and faultlessly geometrical, Parker’s clay forms look industrially made yet they are all thrown by hand and turned on a potter’s wheel. This relates to his on-going interest in reworking industrial ceramic styles by New Zealand born Wedgewood designer Keith Murray (from the 1930s), and his intern Earnest Shufflebotham (during the 1950s), for New Zealand’s iconic factory ceramic ware manufacturer Crown Lynn. Influences on Parker’s clay practice are vast, from modernist ceramics to traditional and contemporary Chinese ceramics. In 2007, Parker was part of an Australasian residency at the FuLe International Ceramic Museum in Fuping, China. This influential international exchange for contemporary ceramists was an opportunity for him to work with Chinese clay and experience first-hand China’s vast ceramic history that he had previously only studied in books. His time in China is referenced by the red glaze, red being an auspicious colour. In Black + White + Red, Parker’s ceramic pieces combine as one overall staged scene, in an interplay of forms and colours to create a unified whole. Based in West Auckland John Parker is considered to be one of New Zealand’s leading studio potters and has been exhibiting ceramics since 1967. In 1975 Parker completed a Master of Arts (ceramics) from the Royal College in London. He has received numerous awards for his work including the respected Arts Foundation Laureate Award in 2010. Parker has exhibited extensively nationally and internationally in the UK, Italy, USA and Australia. His work is held in major New Zealand and Australasian public collections including, Powerhouse Museum in Sydney, the Museum of New Zealand Te Papa Tongarewa and the Dowse Art Gallery in Wellington. Recently Parker undertook a residency at Sturt Pottery in Mittagong, outside of Sydney. Multi-talented Parker is also a renowned theatre designer.